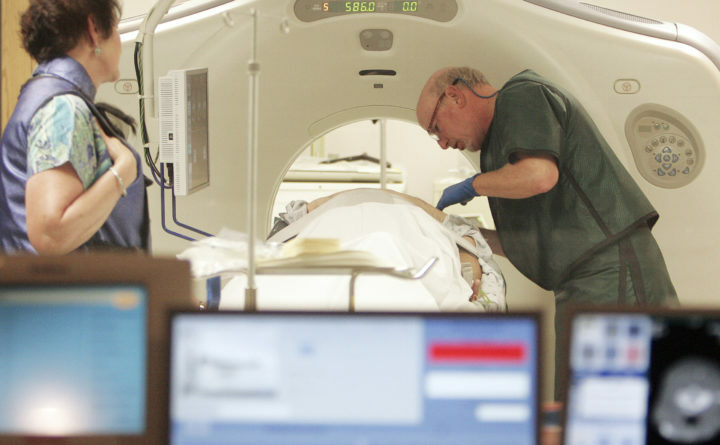 In this June 3, 2010, file photo, Dr. Steven Birnbaum works with a patient in a CT scanner at Southern New Hampshire Medical Center in Nashua, New Hampshire. According to a study released on Wednesday, May 16, 2018, less than 2 percent of eligible current and former smokers have sought free lung cancer screening, five years after government and private insurers started paying for it. Here’s your daily look at late-breaking news, coming events and the national news stories that will be talked about Thursday. The documents show the president reimbursed attorney Michael Cohen as much as $250,000 — with no mention of a $130,000 hush-money payment to adult film performer Stormy Daniels. Pyongyang says it has no interest in a “one-sided” affair meant to pressure the North to abandon its nuclear weapons. The university will pay $500 million to settle claims from over 300 women and girls who said they were assaulted by sports doctor Larry Nassar. The vote is intended to revive Obama-era internet rules that ensured equal treatment for all web traffic. Some 50 out of 60 protesters shot to death by Israeli forces belonged to Hamas, a senior official with the militant group says. Mark Zuckerberg is expected to speak with leaders of the European parliament about his company’s data protection scandal. Thousands of teachers fill the main street of North Carolina’s capital demanding better pay and more public schools funding. “People are not aware that this is a test that can actually save lives,” says Dr. Richard Schilsky of the American Society of Clinical Oncology. The film — now in competition for Cannes’ Palme d’Or — is the true-life tale of an African-American detective who infiltrated a Ku Klux Klan cell. With sports betting on the verge of expanding nationwide, those eyeing a huge payoff should understand that opening a sports book means high risks, uncertain rewards.